About The White Wedding Taxi Co. 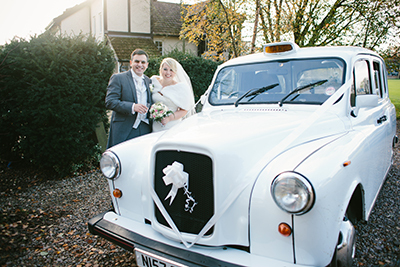 Wedding Car Hire Bedfordshire offers a Wedding Car Hire Service throughout the county including neighbouring Hertfordshire and North London in its Classic White London Taxi Hire making our white taxi an ideal accessory for any Vintage Wedding Car Hire Bedfordshire. The White Wedding Taxi Co. is a refreshing idea as an alternative to the classic wedding car hire. These iconic cars offer everything that a bride and groom expect from a wedding car. Its fun, stylish, offers plenty internal space, is a little something different and still offers the characteristic and traditional features of a wedding car. Our White Wedding Taxi comes fully chauffeured by an experienced driver with local knowledge, great punctuality and attention to detail. They will assist you with what ever is necessary by holding umbrellas or even helping load and unloading your dress! Our White London Taxi is available for traditional Wedding Car Hire Bedfordshire however it has been requested for a number of different occasions from birthdays to anniversaries to proms and promotional events so whatever you have in mind for our taxi, give us a call on 01582 664 964. We promote and provide our White Taxi for the following services Wedding Car Hire Bedfordshire, Wedding Cars Dunstable, Classic, Car Hire Bedfordshire, Wedding Limos in Bedfordshire, Unusual Wedding Cars London, Chauffeur Hertfordshire, Traditional Wedding Car Hire, Transport for prom nights in Herts, Prom Limos Bedfordshire, Cars for special occasions in Bedfordshire, White Car hire Beds, Unusual Wedding Car Hire, Alternative Wedding Car Ideas, Wedding Cars Buckinghamshire, Wedding Car Hire MK, Wedding Car Hire Bedford, Cream Wedding Cars for Weddings.